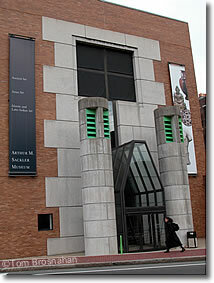 Arthur M Sackler Museum, Harvard U. The collections of the Arthur M. Sackler Museum at 485 Broadway near Harvard Square have been moved to the Harvard Art Museums. Harvard University's Arthur M Sackler Museum, opened in 1985 to house the university's collections of ancient, Asian, Indian and Islamic art, has been closed. Its superb collections of archaic Chinese jades, and bronzes, ceremonial weapons, Buddhist cave-temple sculpture, ceramics, lacquer boxes, important collections of Persian miniatures and Japanese woodblock prints, calligraphy have been moved, and are now on display in the new Harvard Art Museums complex. The collection includes objects from Egypt, Greece, India, Iran and Turkey, especially Hellenic, Hellenistic and Roman artifacts. near Harvard Square in Cambridge MA.